A new interview with me about So Lucky now up at A&U magazine. Today I have an Op-Ed in the New York Times about the rewriting the familiar disability script and changing the world. I resist the idea that nothing can change and that every system is broken. I resist the idea that representation is enough when what we really want is power. 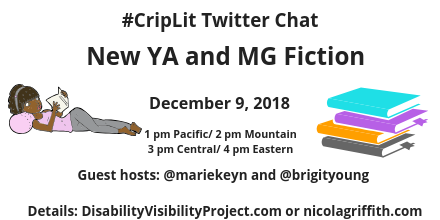 The thirteenth #CripLit chat, co-hosted by novelist Nicola Griffith and Alice Wong, is timed to celebrate the publication of Resistance and Hope, an anthology of essays by disabled people: Sunday 28 October, 4pm Pacific. Booksellers, this one weird trick could increase your bottom line by 25%! One weird trick for booksellers to increase revenues by 25%: make your store, website, and social media accessible. Here are some tips and resources.